Rock ‘n’ roll fever was in full bloom in Youngstown on October 25, 1956 when a show full of superstars from the era arrived to play what was billed as “The Show of ’56” at the Stambaugh Auditorium. 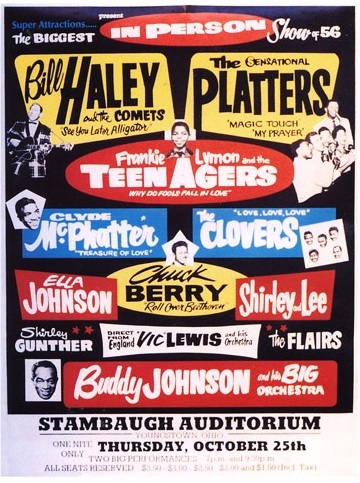 On the top of the bill was Bill Haley and and The Comets along with The Platters. Whoever was designing the advertisement at the time was not using the groups most well-known songs to promote the show. The Comets’ “Rock Around The Clock” was more than 2 years old at this time and more than a year removed from topping the Billboard pop charts. Instead it was “See You Later Alligator” featured in the 1956 film Rock Around The Clock which was used as a hook to draw teens in. The Platters’ hit “Only You” was more than a year old at this point. Here there’s a push for “Magic Touch and “My Prayer”. Frankie Lymon and the Teenagers were pushing the Top 10 hit “Why Do Fools Fall In Love” released in April of ’56. Other doo-wop stars on the bill included Clyde McPhatter and The Clovers. Rocker Chuck Berry, back for yet another performance in Youngstown, was fairly low on the bill. His single “Roll Over Beethoven” peaked at No. 29 on the Billboard charts in June. WHAT THE SHOW SOUNDED LIKE: Here’s The Comets on TV in 1956 performing their signature hit.